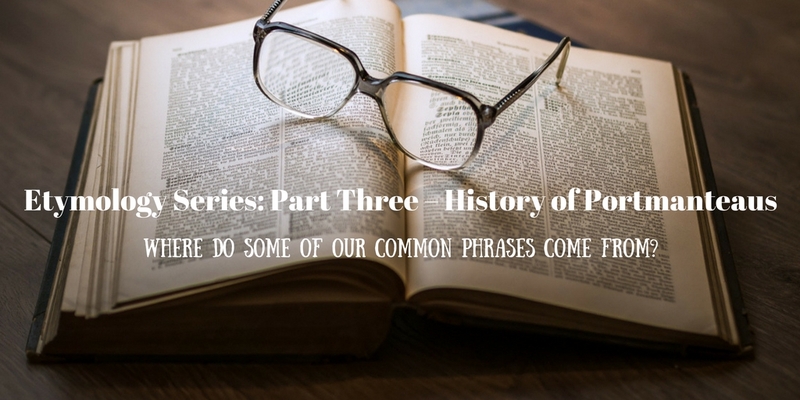 If you’re reading this, chances are you’ve been following along with our Etymology series where we’ve covered the history of proverbs and the history of idioms. But we’re not stopping there. Let’s dive in to discover the history of portmanteaus. A portmanteau is a word created by the blending of two other words in terms of the sounds and meaning. This makes finding the origins of these words interesting. Portmanteau itself is a portmanteau; made up of the French ‘porter’ meaning ‘to carry’ and ‘manteau’ meaning ‘cloak’. The other meaning of this word is ‘a traveling case or bag’ but was coined by Lewis Carroll with it’s new meaning in 1882. These days slang versions of portmanteaus are used all the time in pop culture, for example – ‘Brangelina’, ‘hangry’, ‘labradoodle’, ‘rom-com, the list goes on and on but here are a few words that you may not know are portmanteaus. Believed to originate in 1970s, the English ‘endorphin’ comes from the French ‘endorphine’ with the first element of the word being ‘endogène’ (endogenous in English) meaning ‘growing from within’. The second element is ‘morphine’; a type of pain medication, this is because the hormones found in the brain (the endorphins) are believed to have similar properties to morphine. Napalm itself is a flammable jelly-like liquid used in bombs and other weapons and was discovered during World War 2. Specifically, the word ‘Napalm’ was coined in 1942; it’s origin is pretty simple as naphthenic acid and palmitic acid are the main substances found in Napalm. There a few theories about the origin of ‘hassle’, but it is thought to have emerged in the late 19th century. It’s original meaning was ‘to hack or saw at’. But, at least in the Southern U.S it came to mean ‘to breathe noisily’ in 1928. Between 1945 and 1951 it acquired the meaning we know now; ‘to bother’. ‘Hassle’ is widely believed to be a combination of ‘haggle’ (originally meaning to cut unevenly) and ‘tussle’ (a struggle or conflict) but it is also thought that it could be a combination of these words as well as others such as harass, hustle, wrestle. It may also be derived from the 18/19th century word ‘hatchel’, meaning ‘to harass’. Originally (in 1912) ‘vitamine’, the word was coined by Polish biochemist Casimir Funk, with the first element of the word coming from the Latin ‘vita’ (meaning ‘life’), and the second element coming from the English ‘amine’. At that time vitamins were thought to contain amino acids. They removed the ‘e’ when they discovered that this wasn’t true, and in a turn of luck, the suffix ‘in’ was used for ‘neutral substances of undefined composition’. Quite simply, the modern ’fortnight’ comes from the 17th century middle English ‘fourteniht’, which itself derives from the Old English ‘feowertyne niht’, both of which literally translate to ‘fourteen nights’. Coined in the 1650s, the first element of the word comes from the English ‘dumb’, which itself has a Germanic origin and through time has meant both ‘mute’ (gothic) and ‘stupid’ (dutch and german). The second element is ‘confound’ meaning to ‘cause surprise or confusion’. The word was first used in the 1970s to describe a then-hypothetical network involving many computers. In 1983 when the modern internet started to be assembled the word was still used. It comes from the combination of ‘inter’ (the prefix meaning interactive) and ‘network’. The first element of this word comes from ‘electro’, the shortened form of ‘electric’ or ‘electricity’. The second element is from ‘execute’, which is formally defined as ‘to kill as a political act’ or ‘to kill a legally condemned person’, referencing the death penalty. This second element is actually misleading, however, as ‘electrocution’ is defined as ‘the killing or injury of someone by electric shock’ and therefore is not always referencing death. The word was coined in the late 19th century as this method of execution was first used in 1890. In reference to accidental death it is believed that the term ‘electrocution’ was being used by 1909. ‘Blog’, first used in 1998, is the shortened form of ‘weblog’. ‘Weblog’ was first used in the early 1990s but has pretty much phased out now. ‘Weblog’ itself is a portmanteau of ‘world wide web’ and ‘log’.